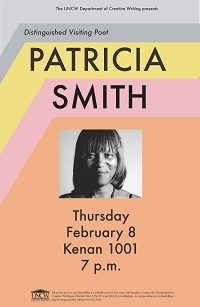 Visiting Writer Patricia Smith to Read Poetry at the University of North Carolina Wilmington Feb. 8. WILMINGTON, N.C.—Patricia Smith, visiting writer at the University of North Carolina Wilmington, will read at 7 p.m., Thursday, Feb. 8 in Kenan Hall 1111. Smith is the author of eight volumes of poetry including Teahouse of the Almighty, Close to Death, Big Towns Big Talk, Life According to Motown, the children's book Janna and the Kings, and the history Africans in America, a companion book to the award-winning PBS series. She is a professor at the College of Staten Island and in the MFA Program at Sierra Nevada College, as well as an instructor at the annual VONA residency and in the Vermont College of Fine Arts Post-Graduate Residency Program. With a background in playwriting, performance, and journalism, Smith is a Guggenheim fellow, a Civitellian, a National Endowment for the Arts grant recipient, a two-time winner of the Pushcart Prize, a former fellow at both Yaddo and the MacDowell Colony, and a four-time individual champion of the National Poetry Slam, the most successful poet in the competition’s history. Her work has appeared in Poetry, the Paris Review, the Baffler, the Washington Post, the New York Times, Tin House, and in The Best American Poetry and Best American Essays series. She has co-edited The Golden Shovel Anthology—New Poems Honoring Gwendolyn Brooks, and edited the crime fiction anthology Staten Island Noir. A reception sponsored by the department and book signing sponsored by Pomegranate Books will follow the reading. All events are free and open to the public. For further information on UNCW’s programs and events in creative writing, please contact the Department of Creative Writing at 910.962.7063.